Once automatic metadata definitions, customization options, and other modifications are complete, your IRI RowGen operation should be ready to run. Create test data for one more or more tables, flat files, or custom report targets at once. For multi-table DB test data generation and population, multiple RowGen job scripts -- along with bulk DB load scripts -- build automatically for batch execution. The batch job generates and loads all the structurally and referentially correct test data into target tables simultaneously. 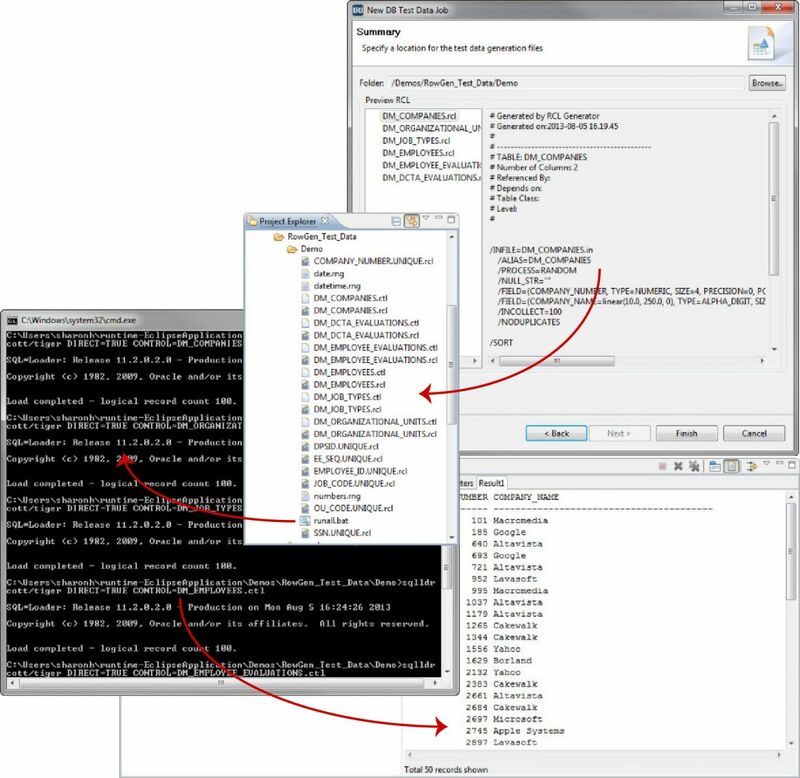 Whether you create one or one thousand jobs scripts and test files, both the metadata and data are accessible inside and outside the RowGen GUI (IRI Workbench) environment. Eclipse file management, job execution, and version control tools are at your disposal. You are also free to deploy and share the materials on the command line or any platform, as they are fully portable. The dialog below, part of RowGen's 'New DB Test Data Job' wizard, shows a test data generation script. It corresponds to one of the target tables, where the metadata was gleaned from the original DDL. This script runs in a batch sequence with others, and bulk loads pre-sorted data to target tables in the order necessary to preserve referential integrity. The GUI's 'Run' menu provides ad hoc and batch execution options for local Windows, or remote Windows or Unix, platforms.